Did you know that the right music can give us energy, boost creativity, lift the spirit, make us more alert, lessen anxiety, decrease stress and pain and even aid in digestion and sleep? Plus, used correctly, it can be a really effective mood boosting tool. 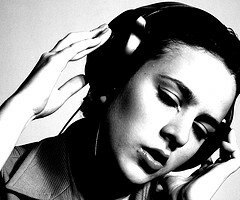 The affect that music has on us is quite profound. In today’s show, I will go over how music can affect your health and show you how you can use it as a stress management tool. Some references I used while researching this show are about.com and musictherapy,org. Cholesterol? Don’t Forget the Triglycerides! Music is a great source of enjoyment for me. I use it for teaching, different language lessons, whenever giving important tests and for background sound to calm students that have a hard time concentrating. I do my house cleaning and relax with different kinds of music.